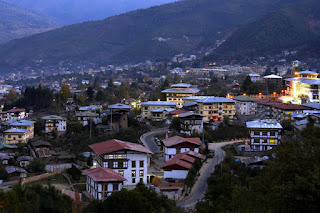 Bhutan (The Land of Thunder Dragon) is no ordinary place. Bhutan is one of the world’s most unusual countries. It is the only country which has been independent throughout its history, never conquered, occupied, or governed by an outside power. The kingdom of Bhutan lies to the north east of India and is situated between west Bengal on the south, Tibet on north, Sikkim on the west and Arunachal Pradesh on the east. It has very high mountains, fertile valleys and thick forest forests. This is a country where buying cigarettes is illegal. Indians do not require a visa to enter Bhutan. A permit is required to enter Bhutan and can be obtained from the border of Bhutan. They require you to present either an Election voter ID card, Driving license or passport. Indians carry at least eight passport photos and eight photocopies of ID card. And after receiving your permit you can go through public transport bus for the very rough and bumpy something around 148 km road to pheuntsholing. On the way you will pass the Jaldapara wildlife sanctuary and various tea and bamboo plantations. And after crossing a huge wooden arch which separates the border and after entering in to Bhutan you will fill Bhutan like as a magical fantasy land.